Since its initial construction, Sovereign Harbour has been in great need of community facilities including a medical centre which would allow Dr Adoki and partners to move out of the converted house that they currently occupy. Studio Four were commissioned in 2007 to design a new-build medical centre and have looked at schemes for several sites; throughout, the intention has been to create a landmark building for the Harbour which also went beyond the minimum requirements for low-energy systems. The scheme provides 840sqm of clinical accommodation and has been designed to work within the framework of a site masterplan prepared by the landowner. The contemporary design incorporates daylighting, natural ventilation and vaulted ceilings where possible internally. Careful consideration has been given to patient and staff privacy and infection control issues throughout. Construction of the new Medical Centre started in October 2006. 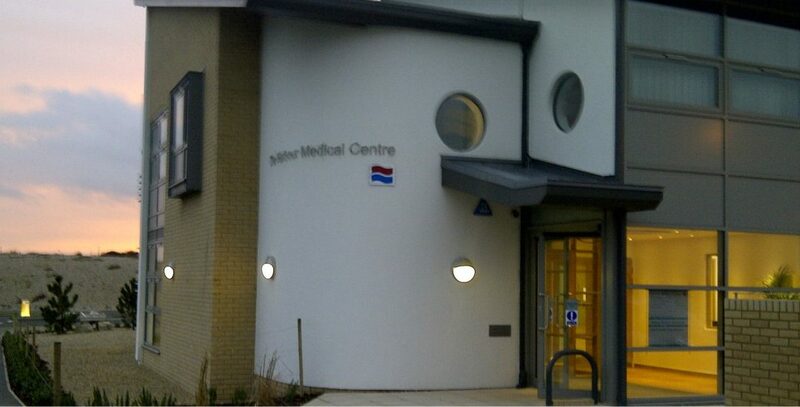 The building was designed as a new home for the GP Surgery, currently based in Melville Street, including 7 GPs and 2 trainees.